Well guys we've seen a bit of all sorts so far! The weather has probably been the biggest roller coaster, first day it was a bit overcast but very warm and humid then it rained a little bit then A LOT on the night into tuesday morning. Dave stood in a really deep puddle!!! I suppose you had to be there but it was really funny! Tuesday turned into another hot and humid day so covering up to enter the Grand Palace was not fun! Yesterday was the best day so far for sunshine so after exploring Chinatown in the morning we spent a few hours round the pool then headed out for some tea. Then came the rolls of thunder and lightning and eventually the downpour! It's just bizarre! 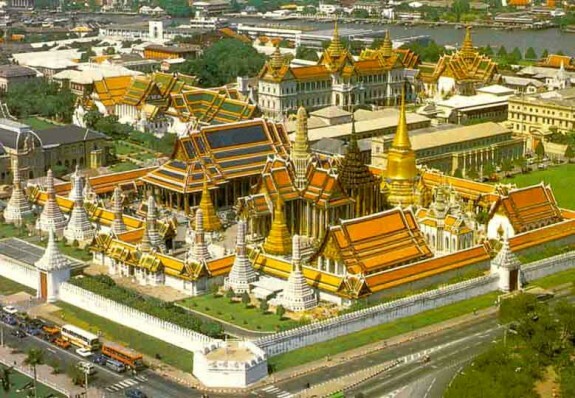 On tuesday we headed out to see the famous Grand Palace, being warey of being scammed we were determined to get there without any hiccups! Sometimes you do just need to listen to the locals though! On arriving at the palace wall the challenge was knowing how to get in. Our sense of direction took us to what we expected to be the front, even though we were told to go another way! Alright so he was right and we were wrong. We ended up walking the full perimeter of the walls! But every cloud has a silver lining right?! Whilst trying to find the entrance we stumbled across Wat Pho temple which is the oldest temple in Bangkok and houses the largest leaning Buddha measuring 45metres long and 15metres high! It is made from bricks and plaster but is covered with gold leaf, one expensive item i reckon! The colours in the temples were simply amazing and made from what we think is cut glass! I'll upload some pictures soon! There was loads of people looking round this temple but there was one family (mum, dad and daughter) that stood out from the crowd! Socks and sandals, socks pulled up to mid calf, high-waisted cut off old jeans, bum bags and ridiculous hats! Talk about giving Brits a bad name!!! We have a picture! The Grand Palace was expensive in comparison costing almost ten pounds each for entry but spectacular. It houses the emerald Buddha which after seeing the leaning Buddha we expected something rather large and there were crowds of people going to see it. It was approx a metre tall and could barely be seen on top of the sparkling gold platform which it was sat on, never mind, i'm sure it's very precious! They have guards around the palace as we do at Buckingham palace and have a changing of the guards like us to. That was interesting to watch. Yesterday we hired a tuk-tuk to take us to Chinatown. On the way the driver got stopped by police and fined. It could only happen to us! He said it was because he just had a t-shirt on and not the required clothing, but the police man suggested his license had run out! His fine was 100baht which is approx 2.20, not much eh! Chinatown was a bit disappointing so we didn't hang around too long. The best bit of the day was returning on a ferry boat, Dave was very excited about this experience. The river is called Mae Nam Chao Phraya and is a hive of activity. It's used by the navy, the ferrys and long boats to transport people and then massive cargo boats pulled by one or two tug boats. Today we are just waiting for the bus to take us to Pattaya for 3 nights. Jaypee My husband and i got quite sitasfied Michael managed to finish up his analysis through the precious recommendations he was given from your own web pages. It's not at all simplistic to just choose to be giving freely guides which often many others might have been selling. And we fully understand we have the website owner to be grateful to for that. The main illustrations you made, the easy site navigation, the friendships you aid to engender it is many sensational, and it is helping our son and us believe that this subject is thrilling, and that's particularly mandatory. Many thanks for all the pieces!